The arrival of spring means the beginning of the sugar season in Quebec. This brings with it the opportunity to visit a sugar shack and celebrate the many maple products available: the famous maple syrup, maple taffy, maple sugar, maple sap… And more recently, a new certification for a maple liquor: Acerum. 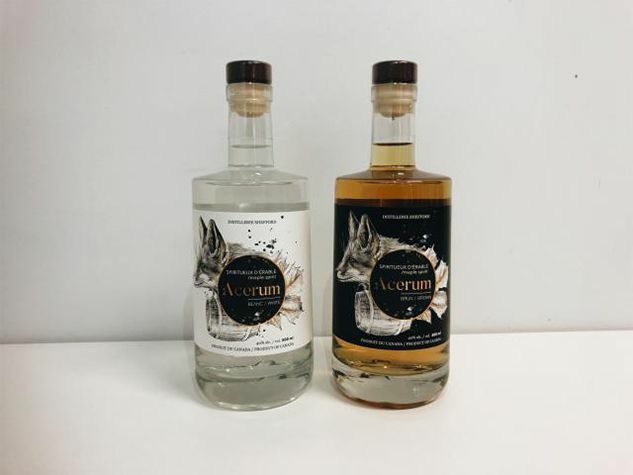 Originating from the Latin name for maple, Acerum is manufactured by the Shefford Distillery, in association with the St. Lawrence Distillery and the Domaine Acer. Together, they founded the Union of Maple Liquor Distilleries. This has allowed the creation of a certification for Acerum which permits the establishment of certain criteria in its creation. The sugar must be made entirely from maple sources, its maple must be from Quebec, all processing must be made in Quebec and the alcohol content must be at least 35%. Acerum is not maple-flavored, but it is certainly made from the distillation of reduced fermented maple. It is available in two versions, white and brown. The first is pure and not aged, while the other is aged and rich in flavors. Brown Acerum received the Food Innovation Award in the category “New or improved products: distilled spirits” at the Gala for the Innovation Awards of the Quebec Council of Processed Foods in 2017. Try it when you’re in Quebec or offer it as a gift! It’s a great way to encourage and support Quebec products. Happy sugar season and enjoy! « Do You Spend Too Much Time Sitting?